This was a question asked by a group member in Tesla Model S Owners Club on Facebook this morning and it received number of very interesting replies that could give a prospective Model S or Chevy Bolt buyer good insight. Here is a serious question: Do you have to order a Bolt now for October delivery? If not, why is this a question now? If yes, the question is what is important to you - size, performance and high tech, or cheap maintenance and a full warranty? Remember, the Bolt would be new, and everything would be taken care of, while a Model S would be at least 4 years old, if not more. Also think about repair effort and cost for body damage. Model S is known to take a lot of time to repair, at specialized shops. The Bolt can be repaired everywhere quickly. I had a Volt before moving to the S. I always wanted an S. But I miss the days when I was less worried about parking my car just anywhere. Didn't like the local Chevy dealer, though. It also depends on how valuable your cargo is. Chevy has design software that makes their cars crash test exempt. The original S got highest crash test ratings in every category. Bc the 700 lb of battery below the floor, they had to use special procedures to make it flip. And when they tried to crush the S, it broke their machine! If you work for a cruise ship, you are probably single and away most of the time. Can you really keep your car plugged in all the time while it is in port? And are you OK with ICE'ing some other EV driver from using that outlet while your car isn't charging, just holding? Given your Ontario base, you might save more money and get used ICE or another EV off 3 year lease. I am a Los Angeles single and I love my S and it is a daily driver. I don't have anyone at home to care for me after an accident. My safety counts. I was able to afford a new one once, but not a new one every 3 years like Tesla would like. My MO is to own a car 15+ years. When new, the battery cost about $40K based on pricing quarter increments at $10K each. 8 months ago, it was $22K. Their engineers said my range loss was normal, so no warranty coverage. I figure I may be replacing the battery 3 more times over the life of the car. While many people are getting 200+K km on packs, I only got 75K km. Another reason to consider ICE or leasing an EV, but I knew I'd be replacing batteries going in. I have been in EV groups since 1995. I had leased the Honda EV+ for 4 years and swore I'd never lease again. But considering pack replacement, maybe leasing is OK. I was in your exact same situation, I went with Tesla Model S. More range, way more car, more cargo, more style. The only thing missing is Apple carplay. So? It’s worth the 11k more now. I doubt they’re going to go that much down. Try your best to budget for the model S. Supercharging is a huge perk, but also think about reliability and software updates. You will have options to improve the car many times over. In 2016, I decided my next car would be a Bolt. Then after waiting a while for it to reach dealerships, I noticed that a used Model S wasn't far out of the price range of a Bolt, and included several benefits (luxury, Supercharger network, and available immediately). Bought my Model S and have no regrets. But the Bolt is an excellent car and a wonder of packaging - tiny on the outside, roomy on the inside (in some ways, the Model S is the opposite). But the Model S is a much more luxurious car with far more features than the Bolt. I don't think there's a wrong answer; to each his own. I have both the Model S and the Chevy Volt but once again, you gotta ask yourself, how do you plan to drive the car? My wife loves the Volt because it's perfect around town for her commutes. We love the "S" when going on trips. I still have to ask Bolt owners, how do they plan a trip cross country? I seriously want to know. With a Tesla, they've made it so simple to plan a trip and hit the road...course in the dead of winter it can be a challenge at times. Keep in mind the Bolt is not a competitor (sp?) With the S. They are in 2 different car classes. Model S is listed as full size, Bolt as subcompact. Bolt is more of a competitor with Model 3. Tesla supercharger network was key for me, safety ratings were key for my wife. S wins hands down. Now keep in mind that all of these comments have been written in a Tesla Model S group and the respondents are mostly Model S owners. What is your take on this question? If you are a Bolt owner, let us know please the advantages of Bolt vs Model S. Please let us know your opinion in the comments section below. 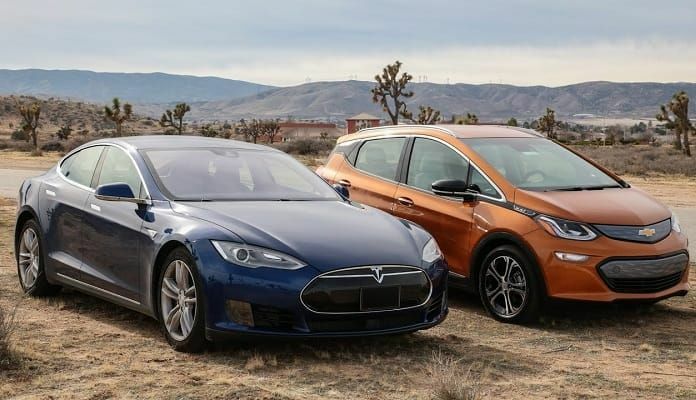 For me, if I was going to pay $35K for either one, I would pick the Tesla over the econobox style Bolt. Chevy Bolt has No charging network. No road trip. I don't like the look of the Bolt. My preference is with Model S.
I'm a Bolt EV owner and have been very happy with this vehicle. It is fun to drive and a great commuter and city car. But currently, it wouldn't be very practical for long road trips. It covers most all of our driving needs in Utah with a great range such that I've only needed to charge at home (with solar panels). However, the ideal scenario would be to have a second EV like the model S or possibly Model 3 that could also be used for the occasional road trip with family or friends. The Teslas are great cars, but I'm having a hard time justifying so much money even for a used Model S. I worry about reliability and battery life with any used EV. I haven't ruled out Tesla yet as an additional car, but I'm closely watching what will happen with charging infrastructure in the next few years. The exciting thing is that it's only going to get better for EV ownership in the future!